Directors at leading Hull based ethical cleaning and laundry products company Bio-D are celebrating after gaining additional listings in Oxfam. 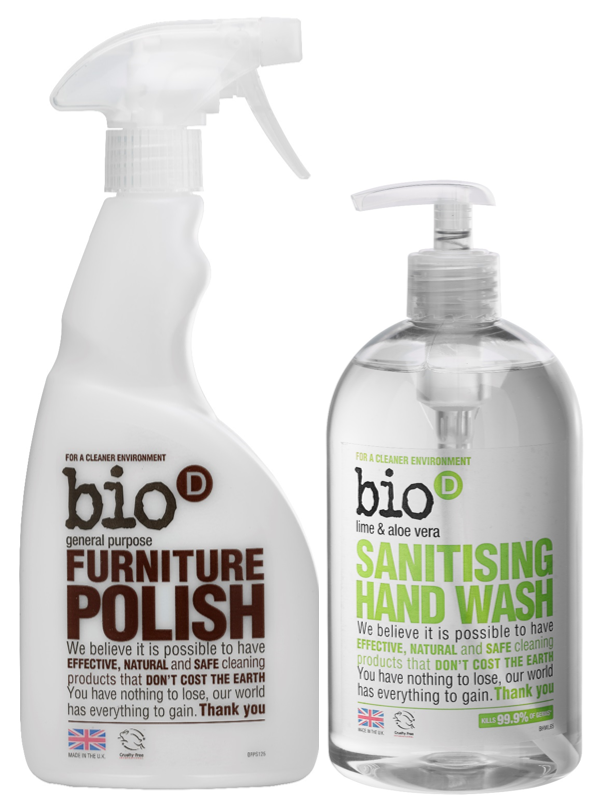 The addition of furniture polish and lime and aloe vera sanitising hand wash brings the number of Bio-D lines in Oxfam to 10. The complete range includes Bio-D’s environmentally responsible cleaning products, including washing up liquid, multi surface cleaner, laundry liquid, fabric conditioner and toilet cleaner that are available in Oxfam stores from Guernsey to Glasgow. Bio-D is an independent, ethically motivated company that is dedicated to promoting the use of environmentally responsible detergents. It manufactures environmentally responsible cleaning and laundry products that are UK made, effective, biodegradable and hypoallergenic. Bio-D’s range of household cleaning and laundry products are made from sustainable, naturally derived raw materials and do not contain chlorine or optical brighteners. All of the Bio-D range is suitable for use with septic tanks and are Cruelty Free International (formerly BUAV) and Vegan Society registered.